The Brazuca ball that Jermaine Jones kicked for the first score of the United States in its tie match with Portugal on Sunday. 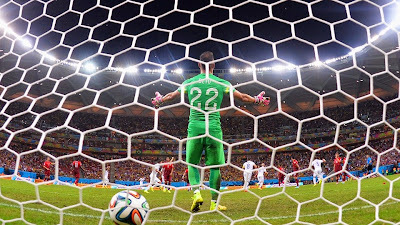 Photos from fifa.com. At the 2014 FIFA Word Cup, there has been plenty of grousing about the high temps and the high ticket prices. But one aspect of the competition that has not caused a hue and cry is Brazuca – not yet anyway. For the uninitiated, Brazuca is the official game ball. What a difference a few years make! At the 2010 FIFA World Cup in South Africa, a body had to get in line to pillory Jabulani. “Dreadful,” “terrible,” and “supernatural” were some of the epithets flung at the ball. It was even blamed for the result of the final. Perculiar, since Jabulani means "to celebrate" in one of the languages of South Africa. It was almost universally agreed that Jabulani, once in flight, was extremely and inexplicably erratic at best. Fast forward a few years after the scientists returned to the drawing board. The result is a ball that is, to put it simply, more grounded in midair. “The Brazuca has very deep grooves – it’s much rougher than Jabulani – and this creates a different pattern of air flow around the ball,” says Derek Leinweber, a professor in the School of Chemistry and Physics at the University of Adelaide (Australia). DL has written and lectured on the aerodynamics of cricket balls, golf balls and past World Cup soccer balls. 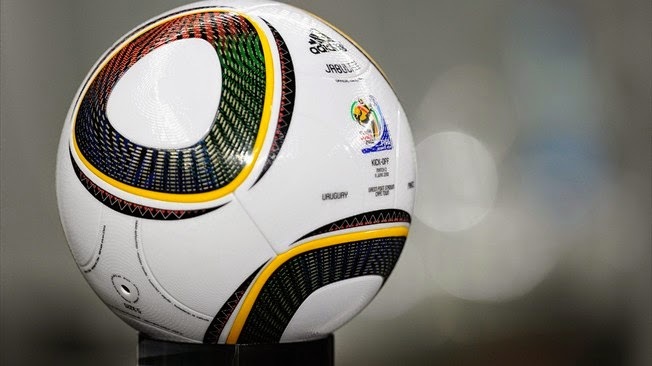 Adidas, which created Jabulani and at the time gushingly called it the most “innovative” World Cup ball to date, is also behind Brazuca. The sportsgear company is calling the latter the most “tested.” That is no exaggeration. Not only has Brazuca been tested with numerous teams on several continents and with hundreds of players, it had to prove its mettle in all manner of weather conditions. 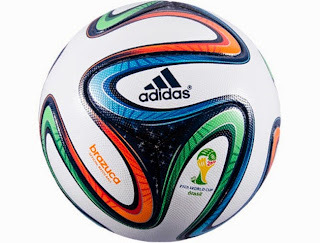 Brazuca weathered various seasons in Brazil, as well as dry, damp and wet pitches. Further, it was taken to high altitudes; the ball was tasked with performing well in winds, heavy rains and gusts. In the end, the review were goods. Jabulani was not a player's favorite. “The Jabulani was much smoother than the Brazuca with smaller grooves and ridges across its surface,” DL recalls. “That meant the ball had to be moving much faster before the airflow around the ball changed from smooth to turbulent. As this shift to turbulent airflow occurred at high speeds, the ball could make some pretty erratic movements on the way to the net. “In contrast,” continues DL, “the Brazuca, with its deeper grooves, hits that turbulent air flow at a lower speed with the result that the ball is much more predictable. In many ways, it’s a return to the aerodynamics of the old 32-panel ball.” (See video above). Lionel Messi, of FC Barcelona and captain of the Argentine team, has said of Brazuca, "My first impression of the ball is that it's really good." LM is an Adidas man, but players not sponsored by the company have also praised the ball. Brazuca got its name through a vote of more than one million Brazilians. It means “Brazilian” or describes the Brazilian way of life. Its design takes its inspiration from the country's vibrant colors, heritage and passion. Along with DL, University of Adelaide PhD candidate Adrian Kiratidis has been hedging the likely performance of Brazuca by matching up the physics of air flow with available wind tunnel data and video of the ball’s movement. AK asserts that players taking hard and fast shots in the 2014 FIFA World Cup won’t find Brazuca as easy to bend into the net as they did with Jabulani. Brazuca has so far withstood the test of time. “Keepers facing players of the calibre of Messi, Cristiano Ronaldo [Portugal] or Neymar [Brazil] are going to be glad that it’s Brazuca coming at them rather than Jabulani,” he says. Today, Feudjou&Co. will be facing the likes of Neymar when Cameroon takes on Brazil. Also today: Netherlands vs. Chile, Australia vs. Spain and Croatia vs. Mexico. Visit http://www.fifa.com/ to learn more about the Addidas Brazuca 2014 FIFA World Cup Official Match Ball, as well as 2014 FIFA World Cup scores and matches.